This colorful wooden set includes 12 wooden, sliceable cookies and 12 toppings, wooden knife, spatula, cookie sheet and a kitchen mitt for safe, "low-calorie" play! The cookies store in a durable dough tube. — Molly Hungerford, manager at Leapin' Lizards Toy Company in Bend, Or., told TDmonthly in a March 2015 survey that Melissa & Doug's wooden play food is one of her store's best-selling eco-friendly toys. Celebrate all the special memories of your child’s life — and create new ones — while making a personalized, environmentally friendly scrapbook! Eco Crafts Scrapbook includes all the materials you’ll need to design and decorate a colorful, visually inspiring scrapbook. Fill all the pages of this hardcover, spiral notebook with photos, stickers, drawings, wooden buttons, string, colorful ribbons and more. Use cardboard paper frames to highlight photographs and use the letter stickers to call out special moments and names. So much fun for a family to create together! Includes over 300 pieces, zig zag scissors, stickers, paper shapes and frames, printed paper, buttons, craft sticks, glue stick, ribbons, twine cords and easy to follow instructions. — Bebe Feimster, manager of Big Smile Toys/Hardware Center in Paoli, Pa., told TDmonthly in a March 2015 survey that the Eco Crafts scrapbook from Alex is one of their best-selling "green" toys. Our beautifully-made Rainbow Wooden Lawn Mower/Vacuum toy entertains toddlers and experienced walkers alike. This unique push toy is made of sustainable maple. 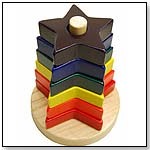 Durable, beautiful, fun and environmentally friendly, non-toxic finishes. 23-1/2"H x 9"W.
An apple a day makes everyone play! With Pure Play Toys' Wooden Apple Ball Roller, kids love watching the large wooden balls meander along the “worm tracks” and through holes in the brilliantly colored apple. This toy's large size makes it a perfect center piece for retailers, homes and preschools. Unlike most marble or ball run toys, Pure Play Toys' Wooden Apple Ball Roller has been engineered to be safe for children under 3 years old. Comes with three 1-1/2” diameter wooden balls - too large to pose a choking hazard. Measures 24"H x 20"W x 8-1/2"D. Safe for ages 18 months and up. Other products from OWI INC. Think twice before discarding that 1985 CD-ROM, don’t throw away that aluminum can, and pick up that plastic bottle left under the couch. We can use them with our state-of-the-art, eco-friendly educational toy kit that will stretch your child’s imagination while allowing them to take part in the joy of recycling. The Super Solar Recycler Kit is powered completely by natural light so you never have to worry about batteries! In addition to your newly discovered treasures, all you need to get started is included in this kit (solar panel, motor and instruction). Your children can recycle a can of their favorite soft drink to create Street Roller and Walking Robot, create Bottle Yacht, Drummer Robot and Flying Bird using a plastic water bottle, and even turn your old scratched CD’s into the super cool CD Racer. — Mark Rosenblum from Hobbytown in Fairfield, Conn., told TDmonthly in a January 2015 survey that OWI was their best-selling brand of STEM toys. Yana™ is the protector of the oceans and all its marine inhabitants along with her dolphin friend Serena; together they work hard to protect the oceans from pollution and its species from over fishing. Yana™ herself is made of recyclable materials and comes with a fashionable brush to style her hair, a luggage tag, a colorful bracelet, her dolphin friend Serena and a doll stand is included as well. Sini™ is the protector of all farm and domestic animals along with her pet dog Misty; together they provide all abandoned animals with food and safe shelter. Sini™ herself is made of recyclable materials and comes with a fashionable brush to style her hair, a luggage tag, a colorful bracelet, her pet dog Misty and a doll stand is included as well. Kazumi™ is the protector of the Polar Regions along with her polar bear friend Ella; together they work hard to prevent the ice caps from melting due to effects from Global Warming. Kazumi™ herself is made of recyclable materials and comes with a fashionable brush to style her hair, a luggage tag, a colorful bracelet, her polar bear friend Ella and a doll stand is included as well. Zennia™ is the original Zeenie™, also known as Mother Earth. She is into high style and fashion, but her true mission is to preserve the environment. Zennia™ herself is made of recyclable materials and comes with a fashionable brush to style her hair, a luggage tag, colorful bracelet and a doll stand is included as well. An eye catching design with an adorable face that children love. The all natural Rubberwood body is easy to hold and play. Featuring eight precision tuned bars arranged in a C scale provides an authentic musical experience and pleasing soundscape. Can be played flat on a surface or vertical. Attractive display box includes set of ten ~4" animal shakers, ranging from whale, elephant, llama, dolphin, bear, porcupine and more. Shakers made from eco-friendly Rubberwood produce a soft and gentle sound. Easy to hold and play. Creative Gravity Play. More than a classic wooden ball run with fun and exciting eye-catching tricks and an easy locking system that keeps your creations stable while you build your maze. With your imagination there are endless configuration possibilities! Specially designed bricks are made from a combination of recycled saw dust and food grade plastic so it is safe, durable and good for the environment. Combine with other Trix Track sets to create even larger tracks, even more Trix and endless fun! 11 style sets available! Other products from GREEN TOYS INC.
Take the helm of the Green Toys™ Submarine for a nautical journey to help protect the planet. Submerge it underwater to explore the terrain at the bottom of the tub, and let it resurface to scan the horizon in search of the next earth-friendly adventure. Made in the USA from 100% recycled plastic milk jugs that save energy and reduce greenhouse gas emissions, this sturdy watercraft features a spinning rear propeller, a flat bottom for added stability, and the classic handle and wide-mouth opening combination for plenty of scoop-and-pour fun. The cabin can be opened for easy cleaning, while the whole vessel is also dishwasher safe. No BPA, phthalates, PVC or external coatings, and also meets FDA food contact standards. Packaged with recycled and recyclable materials and printed with soy inks. — Teresa Derry, owner of Annie's Toy Chest in Cocoa, Fla., told TDmonthly in an April 2013 survey that this was the store's best-selling bath toy. — In a March 2015 survey, two out of 10 retailers told TDmonthly that Green Toys is their best-selling brand of eco-friendly toys. — Taka Andrews, owner of Miller's Toys in Mamaroneck, N.Y., told TDmonthly in an April 2015 survey that the Green Toys submarine was one of their store's best-selling bath toys. One part teether, one part toy. The Green Ring is perfect for teething and beneficial skill building infant fun. The Green Ring is 100% compostable and features GreenDot, a MADE IN THE USA biomaterial made from corn! The GreenRing toy is comprised of a 3 inch loop of smooth maple wood encircled by our soft, corn starch bio-resin. This clip friendly ring is great for travel, easy cleaning, and is 100% eco-friendly. The bright green outer ring can be removed and sanitized in the dishwasher. — Gladys Griffin, owner of Main Street Toy Shop in Columbus, Ga., told TDmonthly in an April 2013 survey that Green Ring is one of their best-selling infant/toddler toys. 6" Race Car Whistle constructed of environmentally friendly Rubberwood with a colorful finish made of vegetable dyes, all non-toxic. Oversize wheels makes it glide easily on all surfaces. Easy to play whistle. An engaging 10.5" bear shape. A natural head drum that is recessed into the body provides an easy playing platform. All wood body made from environmentally friendly Rubberwood. Play it with hands or mallet. Build a fantastic marble run with this brilliantly colored 30 – piece set. Watch the marbles spiral and hop down the various pieces of track. The Marble Run Deluxe is made of PlanWood, a sustainable material made from recycled sawdust. — In a February 2014 survey, Julie Steinbach, owner of Rainbow Toys in Falmouth, Maine, told TDmonthly that Marble Runs were one of their best-selling wooden toys. Measuring 7", our new Bumble Bee Stick Toy is a great teether for little ones. Small enough for little hands and colorful enough to keep their attention. Made with the finest 100% GOTS certified organic Egyptian cotton. Launch date: March 2013. MoonBeam Mini Projectors are the first solar-powered nightlights for kids that project fun, softly-lit designs in their rooms throughout the night. They simply attach to any window, giving parents peace-of-mind by removing temptations for little ones to be drawn to traditional plug-in nightlights. 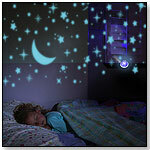 Parents will also love that MoonBeam Projectors automatically turn on at dusk and off at dawn. MoonBeam Mini Projectors come in four stylish colors: green, blue, pink, and purple. All MoonBeam Mini Projectors are sold with the Starry Night theme with additional interchangeable projector lenses available for purchase in the following 3 Packs: Christmas, Flower Garden, & Dinosaurs OR Halloween, Sports, & Starry Night. MoonBeam Mini Projectors keep children safe by removing the dangers of traditional nightlights, such as potential fire hazards, while teaching children the importance of using alternative energy. Launch date: January 2012. 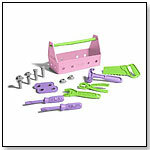 Any project is possible with the whimsical, Green Toys Pink Tool Set. Constructed from 100% recycled plastic milk containers that save energy and reduce greenhouse gas emissions, this trendy tool kit makes any fix-it job an opportunity to go green (and pink and purple) too. The groovy 15 piece set includes a tool box, phillips screwdriver, flat screwdriver, hammer, saw, wrench, pliers, 2 two-hole connectors, 2 nails, 2 bolts, and 2 nuts. No BPA, phthalates, PVC, or external coatings. — As of 1/17/2013 this product had 4.8 out of 5 stars from 37 reviews on Amazon.com. Pros: Eco-friendly; durable; helps encourage interest in building. Send kids to daycare and school with our snack pouch. It promotes reuse and will help keep countless single-use plastic bags out of landfills. 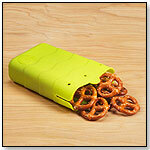 It is also a great alternative to fabric snack bags, which can breakdown and get soiled with frequent use. This snack pouch is easy to close and open thanks to its nifty tab closures. Simply rinse clean and dry and they are ready for the next day. Perfect for crackers, fruits or veggies, and many other tasty treats. Launch date: January 2013. 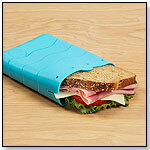 Send kids to daycare and school with our sandwich pouch. It promotes reuse and will help keep countless single-use plastic bags out of landfills. It is also a great alternative to fabric sandwich bags, which can breakdown and get soiled with frequent use. This sandwich pouch is easy to close and open thanks to its nifty tab closures. Simply rinse clean and dry and they are ready for the next day. Launch date: January 2013. · Q&A With Deborah Schimberg of Verve, Inc.